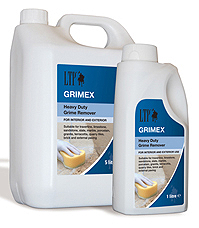 LTP Grimex is a powerful grime remover for interior & exterior use. Suitable for travertine, limestone, sandstone, slate, marble, porcelain, granite, terracotta, quarry tiles, brick & external paving. Effective at removing oil, grease, ingrained dirt grime and old wax layers. Previously sealed surfaces should be re-sealed following use of this product. Surface should be firstly rinsed with clean water and allowed to thoroughly dry before application of re-seal. Product should be tested in an inconspicuous area before general application and should not be used as an everyday cleaner.